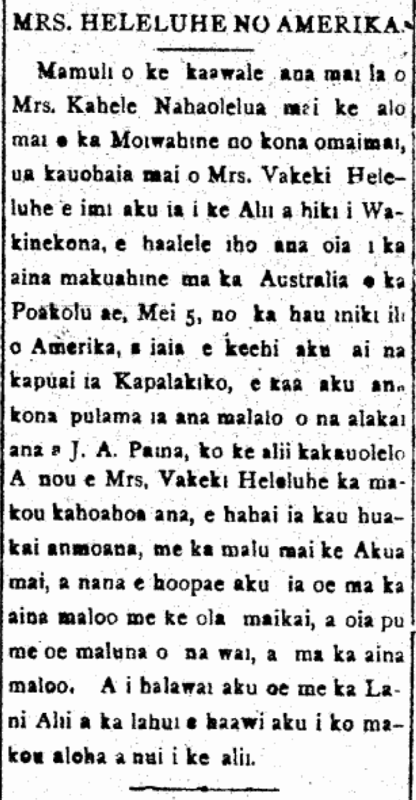 Wakeke Heleluhe to take the place of Kia Kahele Nahaolelua, 1897. 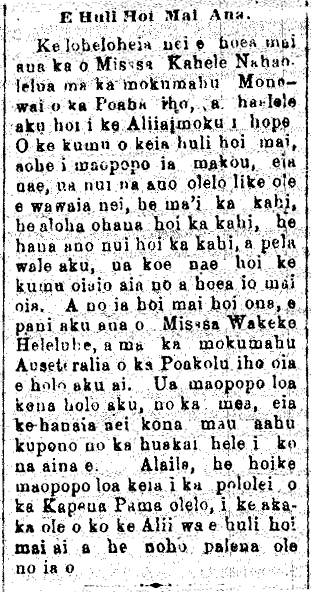 It is heard that Mrs. Kahele Nahaolelua is returning on the steamer Monowai this coming Thursday and left behind the Queen [Aliiaimoku]. The reason for this return is unclear to us, however, there are all sorts of rumors; some say she is sick, some say that she misses her family, some say that she has urgent business, and so forth; the truth will be known only when she returns. And because she is coming home, in her stead will be Mrs. Wakeke Heleluhe, who will leave on the steamship Australia of this coming Wednesday. Her departure is certain, for her wardrobe is being made for her trip to foreign lands. So this is a confirmation of the truth of Captain Palmer’s words that it is unclear when the Queen will return and her stay there is not limited. In the early part of May it became necessary for my companion, Mrs. Kia Nahaolelua, to return to Honolulu. Three months was the length of time I had expected to be absent when I asked her to accompany me; but five months had passed away, and her husband and large family of children needed her. So I sent her to San Francisco under the charge of Captain Palmer, where he was to meet Mrs. Joseph Heleluhe, and conduct her to Washington. Ka Makaainana, Buke VII—-Ano Hou, Helu 18, Aoao 8. Mei 3, 1897.